Don't beat yourself up over this dull punching bag simulator. You've probably seen boxing movies where the would-be hero constantly pummels a punching bag. We've always wanted to do something like that, but we lack a few things, like a gym membership and the ability to box. Manayunk Productions has a solution with the iPod Touch/iPhone game, Speed Bag: Urban Gym, letting you pound away at a bag via the touch screen. It sounds like a reasonable deal for a dollar, but it falls flat. Part of the problem is diversity, or lack thereof. There are only so many colored bags to choose from (brown, orange, red), and the background doesn't change. You face the same blank wall, with the bag standing right in front of it. Only the bag animation stands out. Hit it from the left and it sways the opposite direction, and so forth. 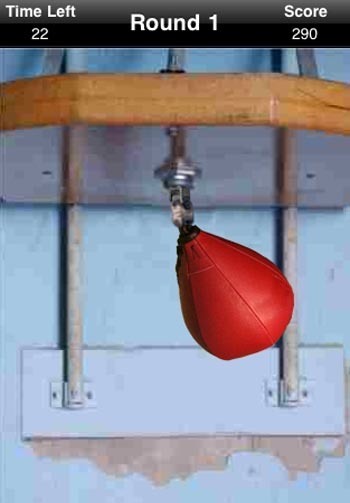 There are numerous challenges in Speed Bag. You'll need to complete a percentage of "good punches" in order to move ahead. It's very difficult to screw up, as the game is a cakewalk. All you need to do is find the right rhythm and you can nail near-perfect workouts every time. This takes away any feeling of progress, as all you do is "tap-tap-tap, tap-tap-tap" and repeat. It's like playing Dance Dance Revolution but without the songs, or the fun, for that matter. Sadly, there's no background music to keep you occupied, only the repetitive punching bag noise. Furthermore, Speed Bag has no online connection, so you can't compare your best boxing efforts with other Rocky wannabes. You're stuck trying to beat your own records, and considering you'll nail them within the first few tries, there's no reason to return. Manayunk Productions should've done more with the Urban Gym moniker, adding more exercises, a trainer and other boxing tools of the trade to give it some value. As it stands, even though it's only a dollar, Speed Bag isn't worth it. The physics are realistic and the challenges are interesting, but the stale gameplay and presentation are less than a knockout. What's Hot: Decent touch-screen interaction, the boxing bag moves realistically. What's Not: Not much to the gameplay, only one background, no background music, no virtual trainer, can't compare times with other players.